Mule Spinner, Museum of Work and Culture. Woonsocket, Rhode Island. 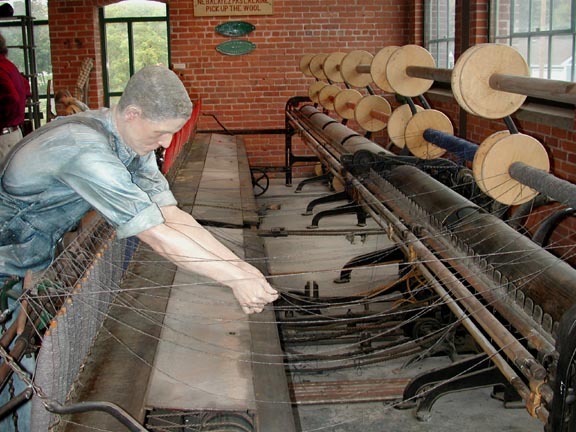 These spinning machines replaced the single-person spinning wheels used before the mechanization of the textile industry, and a machine like this one could do the work of one hundred hand workers. The factory worker (or "operative") who supervised the operation had to make sure that threads didn't break or become tangled. The mechanism opened and closed, and small children, who frequently became seriously injured, were used to untangle threads or tie together broken ones. According to the museum guide, many children were injured, and so mill owners often required operatives to use their own children -- which greatly reduced accidents. The one thing missing from this picture are the many bits of cotton fluff that floated in the air, causing white lung disease among workers.